A classic Christmas Ale, rich warm and satisfying. 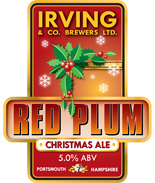 Red plum has three types of Crystal malt added (Barley, Rye and Wheat) to give a distinctive and unique sweet biscuity flavour and a slight red hue, making the beer appealing to the eye as well as the palate. Subtle spicy hop notes make this a beer to sit down and savour through the festive period, a time when we all deserve something as special as this.